Good news – there are finally some good tarts made in Charlotte’s kitchen!! I haven’t updated the blog for nearly two weeks, because 1) life outside was so eventful that my kitchen lost its allure to me temporarily (trust me it’s really big thing for someone like me who always prefers to stay home) and 2) I had been trying to figure out the best method of making these little japanese cheese tarts so that I can share this recipe with you guys. If you are a fan of Japanese desserts, cheese tart shouldn’t sound unfamiliar to you. People are crazy about it, but who can blame them? Taste wise, the tart marries sweet and salty brilliantly. Texture wise, the contrast between the buttery crispy crust and the lava-like cheesy filling probably creates the most unforgettable tart eating experience. I once tried it in Japan, and I simply couldn’t get over it ever since. My take on this tart overall is pretty straightforward, except that I added some milo powder into the crust for a little malty, chocolate twist. 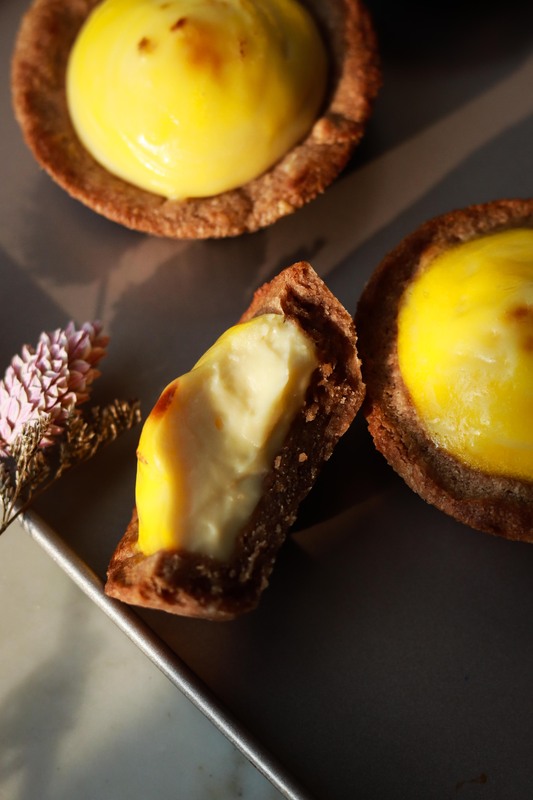 If you follow the instructions carefully, making the tart filling shouldn’t be hard either – it basically resembles making custard with the use of a double boiler, so that things can be cooked evenly and gently without cooking the egg. The cornflour and egg will thicken the mixture considerably so that you can easily brush egg yolk on it before baking. One thing I must remind you here is, that no matter how eager you want to see the result, please be patient to let tart crusts cool and dry up before filling them up. I was impatient before and the tart ended up tragically soggy (yeah you don’t want that). Thanks for reading and I hope you will make them soon! Using a double boiler, heat and melt cream cheese, mascarpone cheese, butter until smooth. Add sifted cornflour and icing sugar, and mix well. Stir in milk, lemon juice, and vanilla, and mix well. Let the custard cool for at least 15 mins before putting them into a piping bag tipped with a round nozzle. Chill it in the refrigerator for later use. Blend together flour, milo powder, sugar, salt, butter with a pastry cutter or a food processor, until the mixture becomes coarse meal with spea-size butter lumps. Add egg and vanilla, and stir until incorporated. Put the mixture onto a lightly floured surface. Add the extra 2 tbsp flour onto the dough surface. Knead the dough for a few times until the dough is brought together and no longer sticky. Press it into a ball, then flatten into a disk. Wrap it with plastic wrap and refrigerate for at least 30 mins until firm. Roll out dough into 3-4mm thick with a rolling pin on a lightly floured surface and fit into tart pans. Prick bottom and sides with a fork. Refrigerate for 30 minutes. Now, Preheat your oven to 375F/190C. Bake tart shell for 15-18 mins . Let them cool in the pan until they’re cool enough to handle. Take the shells out of the pan and let them cool completely on a wrack. Now turn up the heat of your oven to 446F/230C. Pipe custard into the cooled tart shells, brush egg yolk on the surface. Bake for 6 mins on the top shelf (to facilitate browning). If you prefer a runnier texture, try 4 or 5 mins. Enjoy!